When recently recovered Syrian antiquities are stolen in the Greek Islands, Stephanie Cooper and boyfriend James Knox find their vacation interrupted as they help archaeologist friends Kerry and Nico try to recover the treasures. But when one of the missing artefacts turns up in London, suspicion falls on James, who is in financial strife following the death of his grandfather. With a crime syndicate also hunting for the relics, Stephanie and her friends become the target of their search. An irresistible clue sees Stephanie going against her better judgement and following a trail that leads to Geneva and Rome. Too late, she realises that there is more at stake than just two precious ancient artefacts. 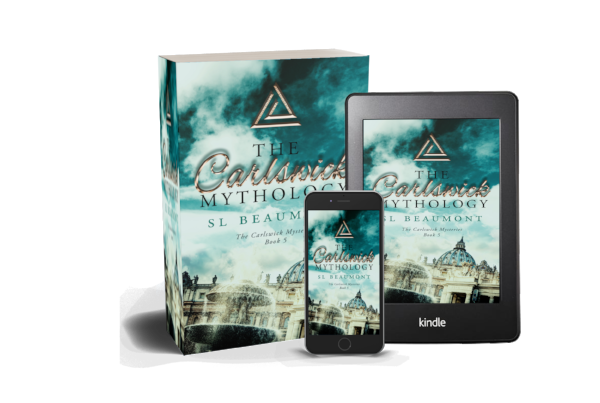 The Carlswick Mythology is a fast-paced, action-packed novel infused with mystery, romance and history. The storm came from nowhere. One minute the small fishing boat was motoring across the sea battling a strong current, the next it was being lashed by sheets of cool sharp rain, driven by a swirling wind. The surface of the deep blue ocean broke apart as white caps formed and tossed the little boat from side to side. Its hull shuddered as it crested a large wave, pausing for a moment at the top before being thrown into the trough. A sickening crack sounded from somewhere below the waterline. The four men on board abandoned their card game in the cabin and scrambled to find oilskin raincoats as the boat lurched and rocked in the churning sea. Two of the crew climbed onto the deck. One followed close behind the captain, who bounded into the wheelhouse and was fighting for control of his vessel. “So long as you still get us to the meeting point by dawn,” Ahmed replied. Beneath the large raincoat, he was better dressed than the others. His deeply tanned skin and dark hair offset cold, calculating eyes. Both men glanced toward a locker near the door. “We both know that getting the box delivered, decides the fate of this vessel and its crew,” Ahmed said. He adjusted his jacket revealing the firearm and knife strapped in a cross body holster, reminding the captain who really was in charge. The captain gave a nervous swallow as a lump of fear stuck in his throat. He had agreed to just one journey in his fishing boat; one journey which paid enough to support their families for a whole year. Ahmed turned and followed the crew out onto the deck. The wooden boards were slick with rain and sea water, and packing crates were breaking free, sliding across the surface as the boat pitched at a dangerous angle. The crewmen were wresting the crates back into position, trying to secure them with strong ropes, when one heavy wooden crate plunged over the side into the churning water. Ahmed cursed as the boat rose to the crest of another wave. They hung on as the vessel rode the wave down into the trough. A loud splintering sound reached their ears as the boat crashed into the lost crate. Water gushed in through a gash in the stern. The men rushed into the cabin and grabbed life jackets. Ahmed braced himself with his legs apart and pulled the sealed plastic box from the locker. He undid his raincoat, lifted his heavy woollen shirt and secured the container against his skin wrapping it around his middle with a length of twine that he found on top of the locker. He tucked the shirt back into his jeans, repositioned his holster and snapped the buttons closed on his raincoat. He glanced at the captain and crew who were huddled together in the wheelhouse, praying. The light of pre-dawn turned the sky from black to slate grey as the rain continued to lash down. The rocky outline of a group of islands rose out of the gloom. “We will try to shelter there,” the captain shouted over the howling wind. Ahmed tapped his phone and glanced at the GPS map image. “Santorini. It will do. If you value the lives of your families, you’ll forget that I was ever on this boat.” The men nodded, cold and frightened. Ahmed returned his phone to its waterproof pouch and fastened it in an inside pocket. “Hold on,” the captain urged as the tide pulled the little boat towards the shore. It crested a wave, teetering precariously, before twisting to one side and dropping with a crash. Ahmed was thrown clear of the boat and when he resurfaced coughing and spluttering, a life ring was floating next to him. He grabbed hold of it and held on tight as the waves carried him towards the beach. Ahmed looked down from the top of the cliff. The rain was still falling in steady sheets. Amidst the debris of the smashed boat strewn across the beach, several large crates had washed ashore, spilling their illegal contents. He could see the figures of the captain and his crew lying on the sand. Shouts sounded from the far end of the beach and flashlight beams bounced as rescuers ran towards the men. Ahmed turned and made his way inland, keeping to the edge of the road. His body was battered and bruised and his clothes wet and heavy, but he limped on. He stopped beneath a copse of trees and retrieved his phone from its waterproof pouch. He tapped the screen, studying it for several moments before nodding. He set off again, walking at a brisk pace through the rain for half an hour before he came upon a cluster of long low buildings with gently sloping roofs. A road sign reading ‘Minoan Ruins, Akrotiri’ pointed toward the complex. Taking a furtive look behind him, Ahmed hurried down the road. Avoiding the range of the security cameras mounted around the front entrance of the main building, he kept to the shadows and skirted around the back of the site. He climbed with considerable difficulty over a low fence into the staff parking area. He glanced at the sky; the rain had eased and the sun was beginning to rise. He had to move quickly. Keeping to the fence line, he crept to a side door of the building. He pulled two thin wires from a zipped pocket in his raincoat and made quick work of disengaging the lock. He crept inside, closing the door behind him. He was in a staff lunchroom. The bench along one wall was tidy with a kettle and microwave at one end. The room contained two long tables set with condiment holders; salt, pepper and olive oil. He listened for a moment before he let out a long breath. He crossed between the tables towards door on the opposite side of the room, cursing as his feet left wet imprints across the floor. He cracked the door open and peered through. The space beyond was silent. He stepped out onto a small platform and gazed down at a labyrinth of excavations spreading out in front of him for several hundred meters. The building was deceptive from the outside. It looked small and contained, but in actual fact the interior was vast. An enormous sloping roof, supported by sturdy poles at regular intervals protected the excavated earthworks from the weather. The foundations of a city of broken shops, houses and public buildings, were laid out in front of him. He shook his head in disbelief and walked down the wooden staircase to the elevated boardwalk which stretched around the excavations. His plan solidified in his mind and he jumped down from the boardwalk into the actual ruins and bent to pick up an archaeologist’s trowel from a bucket of tools tucked beneath the platform. He weaved his way among low stone walls of varying heights, past collections of clay water jars and cooking pots towards some more intact structures at one side of the site. He leaned over the roped-off doorway of one building and gazed at the colourful wall paintings depicting aspects of the life of the Minoans. He moved on to the next structure and crossed the threshold. He crouched down and moved four cooking pots and began to dig a hole in the dusty volcanic soil. After a few minutes, he stood again, wiping sweat from his brow, and reached inside his shirt for the plastic container, which had settled around his middle at the point where his shirt was tucked into his jeans. He removed the lid and lifted out two small canvas-wrapped figurines, laying them in the hole with great care, as one would lay a new-born baby in its crib. He began to push the red soil back into the hole around and on top of the figurines, until they were covered. He packed the top layer of soil flat and moved the cooking pots back in place on top. He stood and wiped his hands on his damp trousers. He backed out of the ruin, scuffing the floor clear of his footprints and crouched down, scratching a small symbol into the wall low down beside the doorway. His task completed, he hurried back through the site to the workers’ office. He let himself out of the building, dumped the now empty plastic box and melted into the shadows.